[CIVIL WAR / RECONSTRUCTION]. Pamphlet. 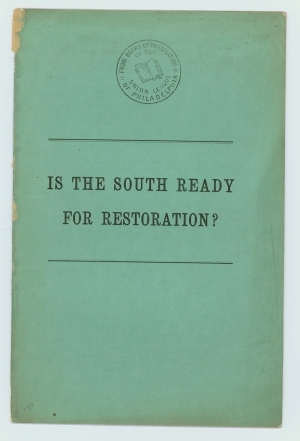 “Is the South Ready for Restoration?” [Lindley Smith]. Stamped “From Board of Publication of the Union League of Philadelphia.” 20 pp., 5⅞ x 9 in. The Union Leagues arose during the Civil War as a function of white middle-class activism in Philadelphia, New York City, and other parts of the North. During Reconstruction (1865-1876), the Union Leagues spread to the South, where black freedmen enrolled, in one of the first steps toward politicization, to support the Republican Party and the idea of equal rights.